The Camp of the Saints is upon us, and as the Third World hordes storm the borders of Europe’s affluent Schengen Area  – by land from the South East and by sea from the South – little accidents are bound to happen. A truck has just been found in Austria stuffed with 50 bodies , apparently victims of heat and suffocation. 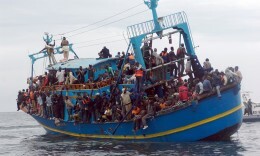 Meanwhile in the Mediterranean hundreds more have apparently drowned in the short gap that exists between Libyan territorial waters and the European navies that serve as a ferry service into the continent. Hundreds of people are feared dead after two boats carrying up to 500 migrants capsized off the Libyan city of Zuwara, residents and officials say. The first boat, which signalled for help early on Thursday, had nearly 50 people on board. The second, which sank much later, had as many as 400 passengers. The Libyan coastguard is still conducting a rescue operation for that boat, but most of those who were on board are feared dead. . . . The victims included migrants from Syria, Bangladesh and several sub-Saharan African countries, the resident said, but the information could not be independently verified. At least 20 migrants have reportedly been rescued from the two incidents. About 2,400 migrants have died trying to cross the sea to Europe so far this year, the UN says. These are the kind of stories that will be used to call for a loosening of any anti-immigrant measures that are still technically in place. For example, Germany recently started  to allow all Syrians in Germany to seek asylum there, even though under EU rules it could deport them if they had arrived in a previous EU country. The EU leaders have also been indulging in general moral signalling, while not actually bothering to burden themselves with the consequences of their actions, leaving that instead to various local communities, where it is obvious that asylum seekers are less than welcome , prompting yet another round of moral signalling . But while news stories of unsuccessful migrants pile up, the question still has to be asked Who’s really dying? Because it is not the migrants or at least the population groups they come from. Instead it is Europe itself. Back in the 19th century, it wasn’t boatloads of non-Whites who were drowning, but instead Europeans. A typical example of many: in 1874, the Cospatrick , a wooden sailing vessel, was en route from Gravesend in England to Auckland in New Zealand. It had 44 crew and carried 433 passengers, including 429 assisted emigrants, of whom 125 were women and 126 were children. While rounding the Cape of Good Hope, the heavily crowded ship caught fire, leading to a panic, which meant the fire could not be brought under control. Under-provisioned with lifeboats as it was, this led to the launching of only two of the ship’s five lifeboats, leaving the majority to drown. Of the two lifeboats, however, one disappeared without trace, while the remaining one drifted for ten days and a distance of 500 miles before being picked up. By that time there were only five men left alive, and they had been reduced to drinking the blood and eating the livers of their dead companions. Shortly afterwards two of these “lucky men” died, making a grand total of three survivors, out of 477. Accidents like this were numerous and frequent in the 19th and even early 20th centuries, when White demographics were extremely healthy and there were vast, sparsely-populated areas, like the Americas and the Antipodes, that put a premium on highly productive European labour. The Titanic is perhaps the most famous case, as along with the transatlantic millionaires who frequently sailed back and forth between New York and England, the ship was also carrying hundreds of emigrants seeking a new life in North America, most of whom died. While sad and tragic, mass deaths at sea are actually a sign of a particular demographic’s health and vitality and its need to expand. While there are many reasons that Africa and the Middle East are ripping themselves apart – the most important being constant Western interference – one of the main drivers is a disparity between population and productivity, in simple terms overpopulation – too many people for the low amount of economic activity taking place. Compare Germany and Egypt, the most populous Middle Eastern state and one that is at least now (thankfully) under the grim rule of a military tyrant. Both countries have similar sized populations – 80 to 90 million – but Egypt’s exports are a little under $25 billion (2013 estimate), mainly oil, cotton, and a few dates. German exports, by contrast, are 1.511 trillion (2014 est.) or 60 times more than Egypt’s. These figures hint at the different nature of 19th century European expansion and that which is occurring now. European expansion was from already economically dynamic areas to economically underdeveloped areas. In short, it was healthy outward growth. Contemporary Third World expansion reverses this – it is from economically underdeveloped areas, areas that are limited in their economic development by the natures of their population, to economically dynamic areas. In short it is inward and essentially parasitical in nature. But if it is parasitical and therefore harmful, why is it being allowed to occur? The simple answer is that although economically healthy, Europe is not socially healthy. This is reflected in various factors like the breakdown of social cohesion and shared values, and the rise of materialism, atomism, hedonism, and narcissism, and most obviously in plummeting reproduction rates. This disjunction between economic health and social health can mean one of two things: (1) there is an essential conflict between social health and economic health, with greater economic development exerting a number of harmful effects on social health; or (2) the global economic system is itself deeply flawed so that those elements in its vanguard are entering into its death throes sooner than other areas. To use a proverbial expression: the fish rots from the head. In the 19th century, global capitalism existed in healthy synergy with its vanguard European population. As capitalism spread so did the White race, as it grew, so did they grow and spread. We could never have had the development of North America and Australia without the “dark, satanic mills” of England or the forges of the Rhur. But over the course of the 20th century, things began to change. The easy growth and gains of capitalism ran out of road, leading to an increasing tendency towards economic cannibalization. The first obvious danger sign was decolonization. Much can be said about the “Wind of Change” and the “aspirant national spirits” of this piece of jungle or that piece of malarial swamp, but, let’s not kid ourselves here, this was essentially downsizing by The West Inc., with cost-cutting, cheap exploitation, and maximization of falling profits at the cost of long-term investment and development. The next danger sign was the rise of feminism and the expectation that women would enter the work force with the same degree of commitment as men. This supposedly “progressive” development was simply a way to reduce the dependency ratio  and dilute the labor market. The result was a larger pool of workers, cheaper labour, drastically falling birth rates, and initially more tax revenue. With more to spend, governments could also grow the unproductive public sector with its attendant nomeklatura, creating an additional artificial economic stimulus that marched hand-in-hand with Keynesian economics and consumerism. The economic model this created – social democratic capitalism with its crass materialistic values – was clearly dysgenic and “sui-genocidal,” but in the spiritual vacuum caused by WWI and the ideological vacuum caused by WWII, there was little resistance. The dystopian circle caused by these factors could only be temporarily squared by the expedients of outsourcing and mass immigration – in essence a cannibalization of Western supremacy. It is this process that raised up first Japan and then China, the cooption of whose highly productive populations, gave globalist social democrat capitalism an additional lease on zombie life from the 1970s onwards. It is this process that has also artificially maintained the service economies, property prices, and client populations of the social democrat nomenklatura, of the West. The vitality of the Victorian economy was demonstrated by being able to generate enormous profit margins by selling its manufactured goods at great distances to the people of the Third World in the actual Third World. Western social democratic capitalism demonstrates its extreme lethargy by maintaining its profits through outsourcing production and by then importing its consumers from the Third World into the First World where they can then be expected to pay – usually through tax-assisted wealth redistribution – a much higher price than if they had stayed in their kraals on the banks of the Niger or their slums by the Ganges. Everywhere in the modern West, the sound you hear is the sound of the decks of the ship being torn up to feed the dying fires of its boiler.